Tour route: Spituk, Zinchen, Yurutse, Skiu, Markha, Thechungtse, Nimaling, Kongmaru La, Shang Sumdo, Hemis are the highlights of this package. Arrival at Leh airport upon arrival meet and assist by our representative and transfer to Hotel. Leave Leh early morning by Jeeps and reach Spituk (1 hr). 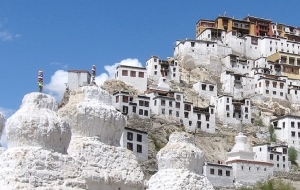 Visit the Spituk Gompa, built about 500 years ago. Start the trek from here by crossing a bridge and walking south-west of the river Indus. The gorge section leads to the confluence of Indus and Zinchen. Camp near the village of Zinchen. It's a gradual climb from Zinchen to Rumbak. From here one gets fabulous views of the snow capped Stok Mountains. From here we move along the Rumbak Nala towards Yurutse. At Yurutse village you will find fields of barley and potatoes. A gradual ascent followed by a steep climb gets one to the Ganda la (4900 M). From here views extend south to the Zanskar range and distant summits of the Himalayan range. This is followed by a long descent to Shingo village. From Shingo the trail heads into a narrow gorge leading towards Skiu. At Skiu there is a confluence of the rivers coming from Markha valley and Shingo. It's a very pleasant hike, up the Markha valley today with the trail crossing numerous streams. Markha is a quaint village with a deserted fort and a small village . From Markha the country changes and the warm, relatively heavily wooded sections of the lower Markha is left behind. One will be required to cross the river several times as there are no bridges here. Hankar, en route, is the highest village in the Markha valley. Trek starts on a good path with several small inclines and a series of grassy ridges. There are a series of mani walls (walls carved with Buddhist prayers) and chortens en route. This is one of the most beautiful high valleys in Ladakh and is dominated by the Kangyaze peak. Today one will cross to the north of the Markha, climbing to the top of the highest of the three passes, the 5,306 M Kongmaru La, with its wonderful views from the top. There are snow peaks in every direction and on a clear day the giants of Karakoram, including K2, can be seen on the north-western horizon. The trail descends to the Martselang valley, following the Martselang stream to the village of Sumdo. 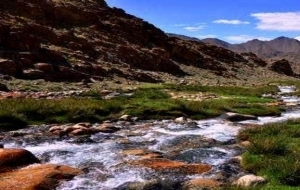 Today make an easy descent along the Martselang to where it broadens into the valley of the Indus at Martselang village. Board the awaiting jeeps. Visit Hemis monastery and after that drive to Leh via Shey and Thiksey monastery. Breakfast at hotel. Later transfer to the airport for the spectacular flight to Delhi.